OEM style replacement stator set to stock specifications. Comes with a one year manufacturer's warranty. This stator that Rick's produces has been a great alternative to the expensive OEM unit for my bike. This stator saved the day and got my Shadow back on the road! Shes now charging just like new. Excellent stator, genuine quality item and a direct OEM replacement. It's hard to find aftermarket parts like these nowadays. The fit was exact and the materials are durable. Rick's Motorsports has an impeccable reputation and this stator is a top notch example. Installation was easy and my charging issue went away. Couldn't ask for more. Swapped out my 15 year old stator along with my regulator/rectifier after having no-charge issues. Generally, my electrical system was fired. Well made stator, as good as OEM, works perfectly. After buying a cheap one on ebay, I decided to go with a quality Ricks. Installed easy and pair it up with a new regulator. Everything is charging normally again at factory spec. There is no gasket included with the Rick's Motorsports stator. If you're careful when removing the stator cover and find the gasket to be in good condition, it may be possible to re-use it when servicing your machine. Otherwise, we do have a wide selection of Rick's Motorsports Stator Gaskets available should you find the condition of the OEM gasket unacceptable for re-use. Rick's Motorsports Electrics stators are not OEM-manufactured stators. They are aftermarket stators that are designed to meet or exceed OEM specifications for the model you select. And, unlike OEM stators, these are covered by a one year manufacturer's warranty. Rick's stators are designed to work just like the stock charging system on your machine. So yes, you can indeed use these stators with a lithium battery and they will not affect the battery's performance. Another thing to consider is your machine's voltage regulator/rectifier as that's what actually controls the amount of power that goes to the battery (and the rest of the electrical system) on your machine. If the regulator fails, then the chances of battery damage (regardless of its type) are greater since it would be putting unconditioned power straight into the electrical system and the battery itself. In the event your machine's regulator/rectifier needs to be replaced, we have a wide selection of Rick's Regulator/Rectifier units available to go along with the stator. You should know that, often times when the stator goes bad, it puts a great deal of strain on the regulator/rectifier since the latter part has to work harder in order to produce enough electrical power to keep your machine running. If that's the case, your regulator/rectifier may be the next unit to go and you should consider replacing it as well. It's certainly possible if your machine has a three-phase regulator. The three diodes (phases) in the unit only allow current to flow in one direction based on the electrical condition of the overall charging system (stator > rectifier > battery), but don't allow current to flow in the opposite direction. In the event that one or more of those diodes has failed, the stator would be running overtime trying to charge your battery on a single phase and eventually burn out. For this reason, we recommend replacing the stator along with the regulator to be sure both of those items are fully functional. As noted in the example above, when the rectifier goes, the stator is stressed as well, and may be on the end of its life as well. The vast majority of Rick's stators come with an OEM plug and the rubber grommet attached. In the case where those are not included, you will have to re-use the OEM connector or grommet in order to install the stator. my bike is not charging. i replaced the stator and regulator. work for about 1000 miles and now i have the same no charging problem. any advise. Your best bet would be to start going through the wires between the stator, regulator and the battery on your bike. Check them for the kind of wear that may be exposing previously shielded wires. In addition, if your bike is equipped with lots of electrical accessories, these may be more than an OEM, or OEM-replacement charging system could handle. Of course, in which case, the battery would never obtain a full charge while those other items sucked the power out of the system. Is this stator guaranteed to fit the 2002 Honda VFR800(ABS)? Everything we sell that's labeled as an Exact Fit item is guaranteed to fit the model you select from our drop down fit guide. We have a team dedicated to making sure every product that has a fit selection is correct for your bike. Check our Fitment Guarantee for more details on why our fit guide is the best in the aftermarket motorcycle parts business! For your situation, the best place to check would be the grounds for the ignition system; e.g. Run / Stop switch, frame, battery and ignition coil. Hondas operates on a normally closed ignition circuit. In this way, when the kill switch is activated, the system is losing ground (breaking the circuit) as opposed to a traditional system like Yamaha, Kawasaki and Suzuki that grounds out the coil causing spark to stop before the plug. If there is a poor connection in the system like to the Run / Stop switch, corroded terminals on the CDI box or ground leads, you could have intermittent spark issues. As I’m sure you understand, it's hard to say for sure without having the bike here to examine, but I would certainly start with grounds and connections in the ignition circuit on your Honda XL600. We do have some additional resources that may be helpful to your needs in the form of Haynes Shop Manuals and Clymer XL600 Service Manuals. Both books have excellent descriptions for diagnosing various electrical gremlins that are common on that particular machine. I HAVE A KAWASAKI VULCAN 900. I CUT THE 3 WHITE WIRES CLOSE TO THE STATOR. AND I DONT KNOW WHAT ORDER THEY GO BACK TOGETHER. Since all of the wires supply the same amount of power to the Vulcan 900 regulator, it doesn't matter how they're wired in. You may wire them in any order you see fit. Yes, we do have an aftermarket stator that'll fit a 1997 Ninja 600R. Just choose the 1997 Kawasaki ZX600C Ninja 600R stator from our fit guide, and we'll send you a stator that'll bolt straight onto your bike. You will, however, need to re-use the OEM grommet that goes in the stator cover to complete the installation since Rick's was not able to source that particular part from any of their vendors. So long as you have that, you'll be all set! Does this fit a 2006 Suzuki King Quad 700? I am mainly interested in what comes with this. Does this come with the crank position sensor? 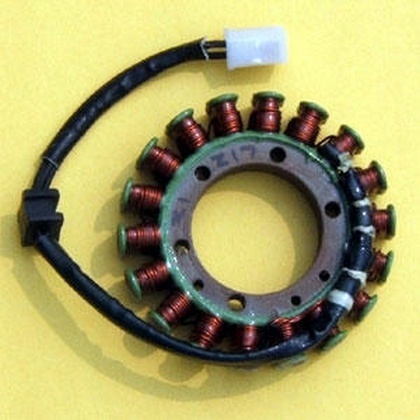 Ricks' aftermarket stator for the 2006 Suzuki King Quad 700 does not include a trigger coil. Once you select your machine from our fit guide, you'll see exactly what's included with the stator for your machine. In the instance you need a crank KindQuad crank sensor, check out our selection of Rick's Motorsports Trigger Coil to get what you need! Are the items new or rebuilt? All Rick's Motorsports Electrics products that we sell are built new by the manufacturer. They're even covered by a one year manufacturer's warranty. Do I need the rectifier wiring harness or does this come with the plug? The replacement stator that fits a 1998 Honda CBR600 F3 plugs straight into the OEM wire harness. There's no need to cut or splice anything to fit it on your machine. What you see photographed after you select your bike from our fit guide is exactly what you'll receive. If you were to choose the 2005 Kawasaki ZX636C Ninja ZX-6R from our fit guide, you'd get the correct stator to fit your bike. As it's designed to be an exact aftermarket ZX-6R stator replacement, it'll bolt straight on without issue! Is this product compatible w/ OEM Part #3089579? As long as you are selecting your exact model from our drop down menu 2005 Polaris Ranger 500 4x4, that part would be a directly replacement for the OEM Polaris part number 3089579. What warranty do the stators have? All Rick's stators come with a one year manufacturer warranty directly with Rick's Motorsport Electrics. In the unlikely event you were to experience an issue with a Rick's stator within one year of purchase, simply reach out to us and we can file the warranty claim to get the process started. Those are to stay in place, they hold the wires in place to keep them from being caught by the rotor assembly. Do not remove them.